We had a fun Easter dinner, but I think the best part was dessert. So many Easter recipes feature eggs, but I found this Egg-Free Chocolate Cupcake recipe with Orange Buttercream Icing. I should have made the icing a different color, to avoid the ‘Halloween look’, but these were great tasting cupcakes. The cupcakes use basic ingredients like flour, and sugar, and cocoa powder, with chocolate chips for good measure. You don’t need flax, or chia or any other egg substitute; the recipe just works. They are so moist, they stick to your fingers when you eat them. The frosting is a basic butter/powdered sugar blend, with orange juice for flavor and gelatin powder for color. So you really could make these any flavor and color. This will be my new go-to recipe for holiday cupcakes! Although my birthday always falls near Thanksgiving, we still manage to find time for birthday cake. My request this year was for a chocolate cake with pink frosting. This Chocolate Beet Cake with Beet Cream Cheese Frosting fit the bill perfectly! The recipe is from Joy the Baker, and she almost rivals Smitten Kitchen for great recipes. You might be thinking – “beets…creative!” But you might be thinking – “beets….yuck!” Let me assure you that you can’t taste the beets in the cake or the frosting. They only serve to make the cake moist, and the frosting a bright pink. It helps to roast and grate the beets a day ahead because that’s really the messy part of the project. After that, it’s a pretty straightforward two layer cake recipe. My Mom did the majority of the work for the cake, and had my older nephew help with the frosting. 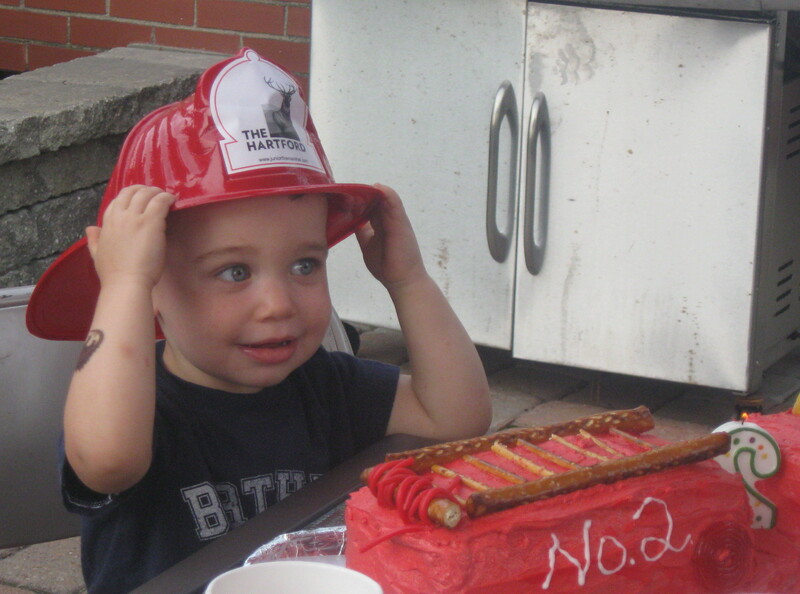 Later he got to decorate the cake with sprinkles, and then it was time for his favorite part, the candles! With his little brother already in bed, he got to be center stage to help sing and blow out the candles. Thanks to my family, it was a fun night and a fabulous cake! My Mom baked the chocolate cake using the Hershey’s Old Fashioned Chocolate Cake recipe. We considered baking the cake in a Pyrex bowl so it would be a half sphere shape, but some Googling revealed that it can be difficult to make sure the center of the cake is adequately cooked without burning the edges. So we baked two 8″ round cakes, and then used a simple butter and confectioner’s sugar frosting to ’round’ things out a bit. We used red cookie icing to decorate the cake with the stitching and a “3”. This may have been our simplest cake project yet, but it was still a great cake and we had fun making it. And yes, the cake was served with fruit salad which included grapes. I feel like my blog has been one big party this summer! We’ll get back to “regular meals” by the end of the week, I promise. But first, I have to share the story of The Great Train Cake. The bar for first birthday cakes was set pretty high back with these Monkey Cakes of 2010. But of course we had to do something different for my youngest nephew. 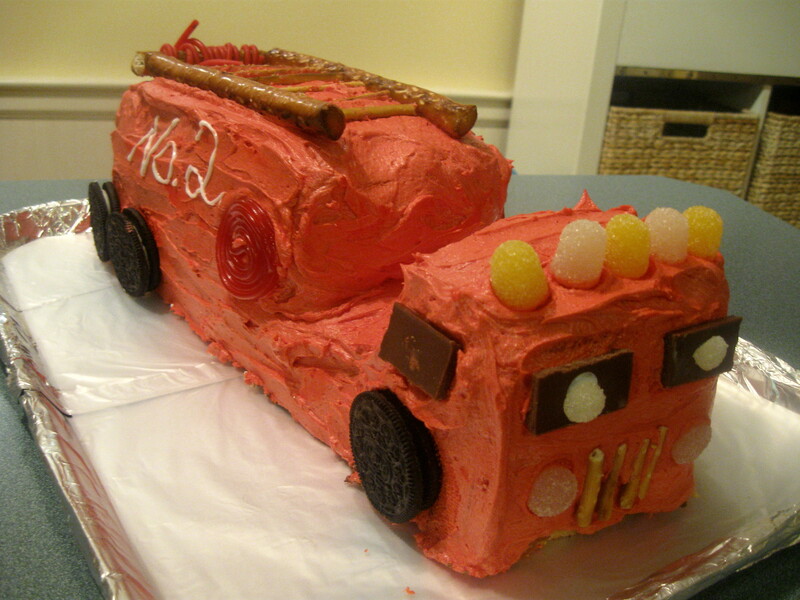 I am not sure who came up with the idea for a train cake first, but the project was planned with many Google searches, Pinterest surfing, sketches, and long lists on legal sized paper. But all the details aside, we had a lot of fun. Hop aboard for the full story, or scroll to the bottom just to see an adorable baby toddler eating cake. My Mom used Smitten Kitchen’s Best Yellow Layer Cake recipe, and multiplied it by 1.5 to yield a 13″x9″ cake and a 9″x5″ loaf pan. She baked another 13″x9″ cake using Hershey’s Old Fashioned Chocolate Cake recipe. She used one half of Smitten Kitchen’s Two Layer Banana Cake recipe to yield another 9″x5″ loaf pan. You might be thinking that 1) that’s a lot of math; 2) that’s a lot of baking; and 3) why did they need 3 different types of cake? My Dad helped a bit with the math, my Mom did the baking over the course of 2 days and stored the layers in the freezer, and yes, we’re a little crazy and wanted some variety in the flavors. First, we started with a cake board. It’s important to have a sturdy surface, especially since the cake must be stored in the refrigerator. We placed the 13″x9″ cakes side by side to form the base layer. The majority of the cake was frosted with Smitten Kitchen’s Vanilla Buttercream Frosting, but we used canned chocolate frosting for the engine. We colored the vanilla frosting in small bowls as we went along. We coated the top and sides of the base layer with the vanilla frosting, and then piped on chocolate icing for the train tracks. The loaf pan of banana cake was cut to form an engine, using this Betty Crocker video as a guide. The loaf pan of vanilla cake was cut into thirds, to form 3 train cars. You’ll notice that only 2 of those train cars fit on the cake; sadly, one car had to be left behind in the station. My Mom’s kitchen looked like a scene out of Willy Wonka’s Chocolate Factory. We had a lot of different ideas on what to use for wheels and other train decor. In the end, we used generic chocolate sandwich cookies for wheels. We used Twizzlers to outline the top of the train car. Other candy we used includes M&M’s, Junior Mints, and peach rings. It was a hot August night, and the frosting was melting, so we put it in the refrigerator at this point. It just fit. The next day, we did some touch-up work with frosting, and added a “1”. Finally, it was time to bring out the cake and serve it. We all sang “Happy Birthday” and he got some help blowing out the candle. Note that my sister removed the pieces of candy which could be a choking hazard before placing the engine in front of him. All he wanted to do was stick his fingers in the frosting, which he decided he liked. I am not sure he even got to any cake! The cake project was a lot of fun, and we’ll remember it for a long time! In addition to the ravioli, my Mom had one other request for her birthday – homemade ice cream. Specifically, she wanted to try this Cinnamon Graham Cracker Ice Cream recipe from Penzey’s. We put together the ingredients, and poured them into our Cuisinart ice cream maker. The ice cream maker produces a soft-serve consistency, so we placed the ice cream in the freezer after that to harden further. After what seemed like a long wait, the ice cream was ready. My nephews were very excited to help blow out the candle in a container of ice cream!